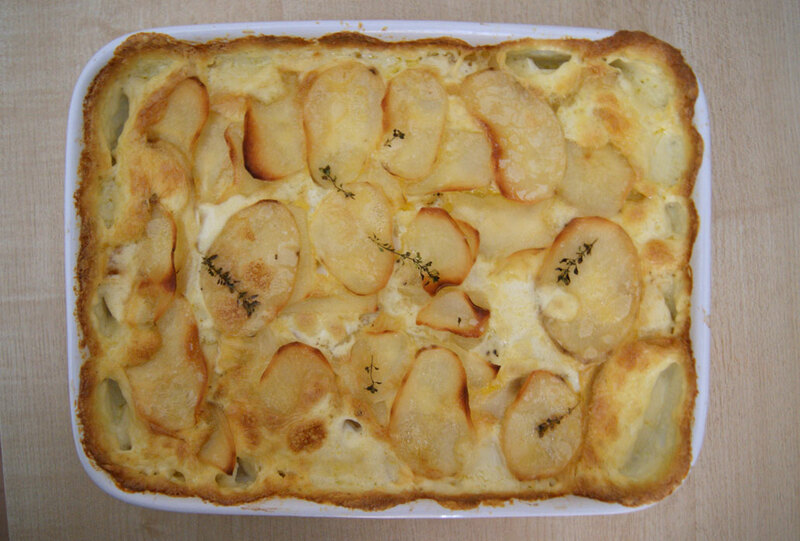 Gratin dauphinoise is a sinfully good, classic French dish that I wish I could eat everyday. Unfortunately my hips would never forgive such indulgence so this dish is reserved for high days and holidays only. Oh, and those days when you realise you ‘accidentally’ bought too much cream and need a way to use it up. I can’t only be me who does that, right? Continuing the party food theme, all good dips require something good to dip in them. My main requirements for dipables is that they are nice and crunchy so you have a texture contrast and strong enough to support a generous scoop or dip without crumbling or breaking off under the load. I’m a big fan of crudities – usually carrot and celery sticks but it’s nice to have something a little less virtuous on offer. When I need a clever little something for a party I often turn to Chocolate and Zucchini for ideas; I think Clotilde must be a consummate hostess since her blog and cookbooks have no end of great recipes and tips for entertaining. 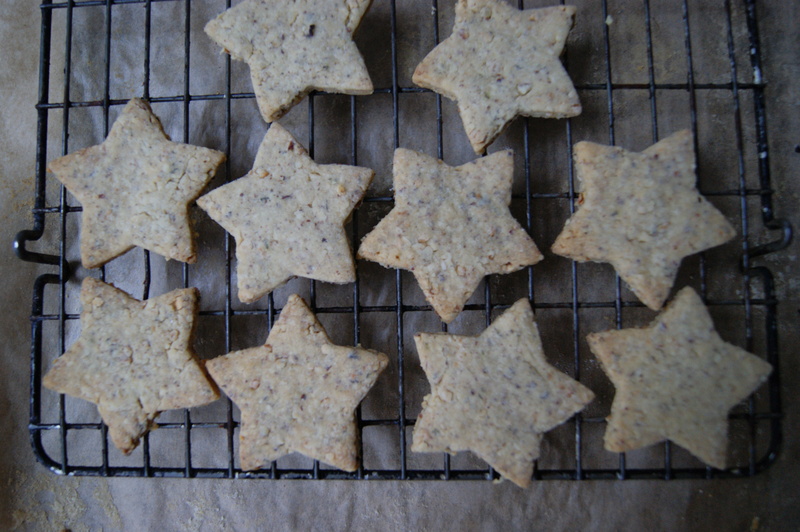 I’ve made her hazelnut and thyme crackers many times, in many forms and doubt I’ll ever be bored with them. They have a beautiful crumbly, nubbly texture from the finely chopped nuts and herby, earthy notes from the thyme. I thoroughly enjoyed my trip to the greengrocer this morning; after a long winter of muddy roots the fresh spring fruit and veg is brightening up the shelves. Fresh peas, plump strawberries and wiry asparagus were piled high and a big box of locally-grown baby plum tomatoes had pride of place by the door. I took my time browsing and left with my bag overflowing with goodies, including plenty of those shiny, red tomatoes. As a devoted fan of the wonderful Nigel Slater I often turn to his books, articles and shows for inspiration. 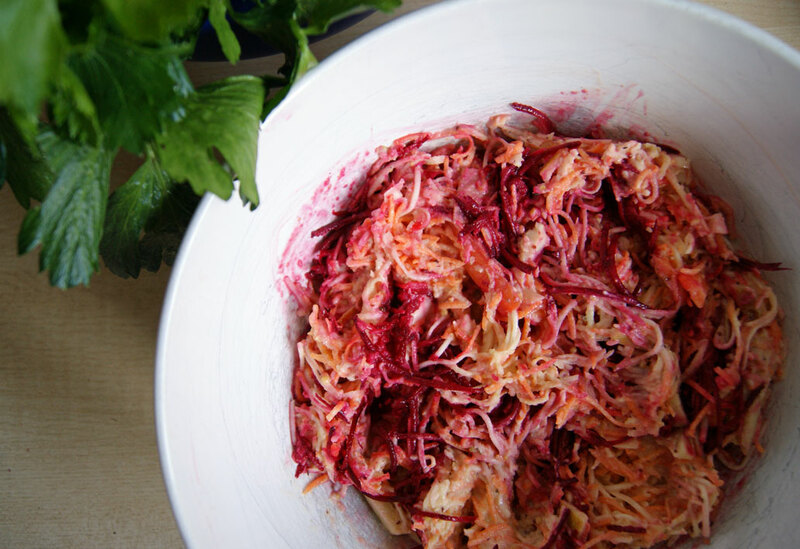 He is a keen gardener which is probably why he creates so many simple but stunning recipes for vegetables. I was sure he’d have something perfect for my haul and so he did. This fab and speedy recipe is not your usual tomato sauce; rather than roasting or sauteing the tomatoes, you char them under the grill making them smokey and sweet. I tweeked the original a little; I also happened to buy some gorgeous wood-smoked garlic that was begging me to join in the fun. If you can find some, pop it in, you’ll be glad you did! A handful of fresh herbs, some melty mozzarella and the first of the home-grown salad made my morning’s shopping into a fantastic light dinner. But there’s no need to stop there, this sauce would be lovely on bruschetta or made on the barbeque. Pre-heat the grill to the highest setting. 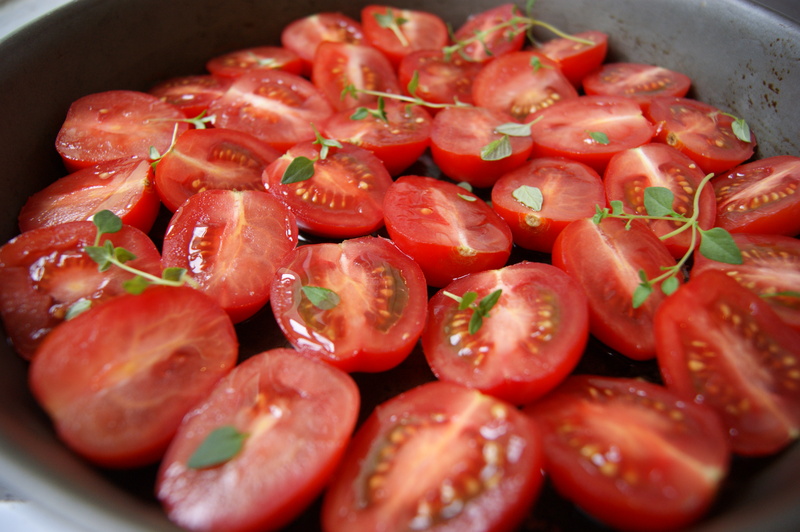 Meanwhile halve the tomatoes and arrange in a baking pan deep enough to catch the juices. 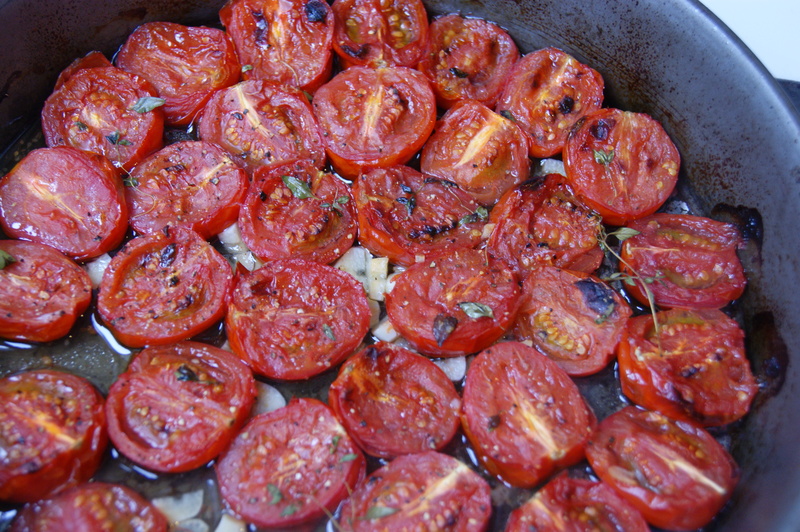 Slice the garlic and tuck underneath the tomatoes. Drizzle over some olive oil, scatter over thyme leaves, salt and pepper. Pop under the grill until charred*. Roughly mash the tomatoes with a fork and taste. Add vinegar if too sweet or sugar if too sour. 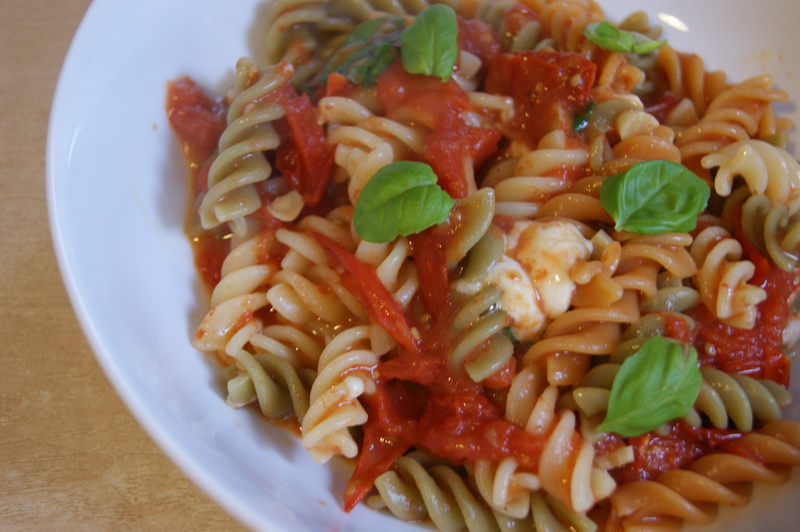 Stir in the basil and mozzarella and serve immediately. *This took about 15 mins in my rather slow grill, start them before the pasta and check regularly.